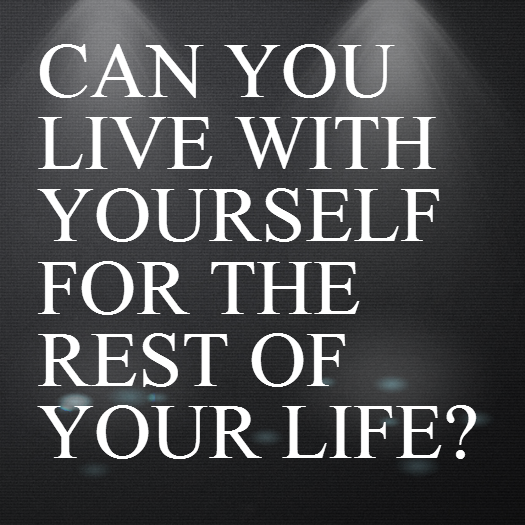 If you were not you, could you live with yourself for the rest of your life? When making a decision for a relationship or marriage, this is one question you should ask yourself and answer honestly. So many times, we hear people say this is who I am and I can’t change for anybody, and the funny thing is we sometimes say it too. But can I say; that is a selfish thing to say. The truth is we may be difficult to live with, greedy, quick to anger; we may have attitudes or characters that even we are ashamed to admit. If you yourself are ashamed of some of the attitudes you possess, why do you think someone else should be happy to put up with it? I know we say these things from a place of confidence, and you shouldn’t change who you are because of another person but there are habits, characters and attitudes in our lives that are bad and needs to change. We have to grow up and mature, people should accept you for who you are, but you can’t expect a relationship to grow or you, yourself to grow if you aren’t willing to mature and get rid of bad habits. The truth is you may not even attract the type of person you desire or need because of some characters you still exhibit, not everybody will put up with that selfish talk, that’s just how I am. If you can’t live with yourself for the rest of your life, don’t force someone else to, don’t get angry or be bitter when others make the choice not to live with it. Let’s stop making excuses for bad habits we have. If who you are isn’t good enough then you have to change. We are not perfect but we should strive to perfection. The goal is not to change for people, but for us to be better children of God, and better human beings. If there are characters in you that you aren’t proud of, habits in you that make you cringe, please let’s change them. Ask the Lord for help to change habits in you that do not give Him glory.